I'm on the way up to Portland for Thanksgiving weekend....an old city where these bottles were all once shipped off to, after being blown in San Francisco. Pictured Left to Right (Below): Union Oval 1/2 Pint Flask (TT) with embossing inside of slug plate, Knife-edge Pint Flask (AT) with full-faced embossing, Open-faced Fifth Cylinder (AT) with open-faced embossing, and Knife-edge Pint Flask (Transitional TT) with embossing inside of slug plate. And while I'll be visiting their destination place; they will be making the journey back towards their place of birth, not too far off from S.F. Coming soon to an Auburn sales table near you....(all but the dark flask on the right will be offered for trade or sale). Dale recently mentioned that it seemed to be up to Lance and he to keep fresh posts appearing. I thought I'd help out as well. A couple of bottles sit proudly on my shelf; both "prides". One sports a glop top, the other tooled. And hence, this post is a tie in to the blurb that Dale recently put forth. The previous article pointed out the overall rarity of this particular bottle in glop top. Originally thought to be blown exclusively with an applied top, one example with a crudely tooled top appeared around 2000. I'll take it a step further and point out that the glop tops outnumber the tool tops by at least 10 to 1. Assuming a total count of between 30 - 40, that leaves, at the most, 3 - 4 tool tops in collections. Thomas dated the Pride as being blown between 1874 - 1879. I've owned five over my forty some years of collecting. All were, quite obviously, blown in the same mold.The brand was registered with the U.S. Patent Office to Livingston & Co. in 1873. So, Thomas was no doubt correct with his ca. 1874 dating. Livingston left the company in 1878 so that, and not 1879, would definitely spell the end of the bottles embossed Livingston & Co.. 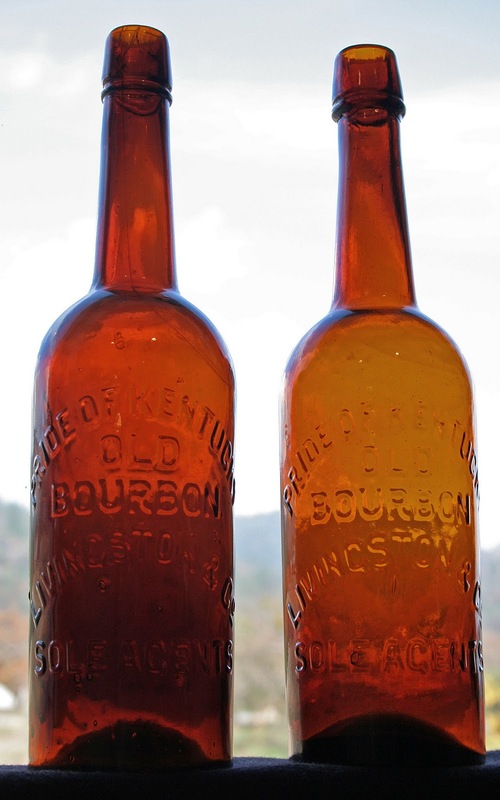 However, based on the few surviving examples, one would think that the embossed bottles were most probably only made for one run, and then sold in paper labeled slicks after the embossed supplies ran out. There's some nice Western bottles being offered this time around at "American Bottle Auctions" a few of you are likely interested in. I had a chance to view many of the bottles first hand on a recent trip to the auction house. For those interested I have a page on my website at http://www.oldwestbottles.com/ highlighting a few of the Western items in this round. Auction closes on November 14th, check it out at www.rtam.com/americanbottle/cgi-bin/catalog.cgi Oppertunity knocks for some rarely offered Western bottles. Well, I guess it is up to Lance or myself to post stuff...I thought I would share a recent discovery with all you "bloggers". Recently I received a phone call from a plumbing contractor. He said that he had been doing some work under an 1860s house in "anytown, Oregon", and had found a crusty old flask with it's contents, and cork. It was embossed "S. Adolph, & Co. Salem, O." The flask was laying under about an inch of that grey light hanta virus laden dirt that we find when we crawl under old buildings. This house was being remodeled, but had modern plumbing, and electrical circa 1950s, so people had crawled around that house numerous times. The contractor indicated that he had not yet told the actual homeowner about the find, but would later in the day...he asked what the bottle would be worth, and would I be interested? I was very excited, and told him to discuss it with the homeowner, and have either of them let me know if the bottle was available. If it was, I would make them an offer, and they could discuss it. He told me the homeowner's name, and hung up the phone. Needless to say, I was pretty excited. There were only two pints, and one half pint known, and I had two of them already in my collection. I waited for the phone to ring...for 5 months. One day while I was in a TOC privy, my cell phone rang and it was the homeowner N.J. He stated that the bottle was available for me to purchase if I was interested, and he would be in Medford on the following Friday. He would meet me, and I could take a look at the flask, and we would work something out. He was going to provide a finders fee to the plumber from the proceeds. Friday came, and just as promised, N.J. was at the meeting location carrying a little playmate cooler. In the cooler was a pint flask wrapped in rags,, and completely black inside and out. The contents had dried to a brick consistency, and the outside was coated with black crust. I could not tell if the bottle had a crack all the way around, or was mint, but I made an offer, and the deal was done. This was pretty risky. I removed the doubled over leather "cork" and used paint thinner to remove the black tar stuff. I was relieved to find the flask in pristine mint condition! While not the most elaborate or fancy embossed flask, this is the only tooled top pint known, and proves that there are still some great finds to be made out there. It is one of the West's rarest flasks, and one of Oregon's top bottles.The Hotaling glob top fifth from this Summer and this flask are great pieces of history found by non collectors!